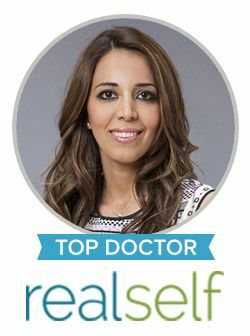 Dr. Sanaz Harirchian is an incredible doctor, with an amazing eye for the face! She is so kind, and really takes the time to help you understand the procedures she offers, and what you choose to do. She knows how to use fillers correctly so you never look over done! Dr. Sanaz works magic. I did the liquid rhinoplasty in the office. It was a very short, in office procedure. She is completely professional and made me feel at ease because she was so confident in the procedure. She is very gentle and let’s you be involved in every step of the way. Will definitely be back! I recently had a rhinoplasty done by Dr. Harirchian and she did a wonderful job!! Along with fixing the appearance of my nose, she also did a septoplasty and turbinate surgery to improve my breathing. Dr. H improved the breathing issues 100% and the outside appearance looks completely natural. She is a very caring and compassionate doctor who is great at what she does. She went above and beyond what I expected any doctor to do, she even personally took the time to check on me during my recovery period. Dr. Harirchian is very passionate about her craft. I would highly recommend her. I wouldn’t trust anyone else with my face. Dr H is amazing. I had trouble breathing and hated the shape of my nose and she fixed both. My nose looks amazing! I couldn’t be happier with the results! I would highly recommend her to anyone looking to improve their appearance. Very natural facelift! Could not be happier. Highly recommend. I wanted improvement in my skin. Dr Harirchian recommended microneedling with prp. I had the procedure done a month ago and I love the results. My skin is smoother, shinier, and softer. I had a torn earlobe which really bothered me. Dr Harirchian fixed my ear lobe the same day and it looks amazing. I am so happy I found her! Dr Harirchian was very kind and patient with all my questions. I just got my stitches out but I am already loving the results of my upper eyelid surgery! From the onset I received EXCEPTIONAL customer service from the administrative staff. During my consult, Dr. Harirchian took time to fully understand my issues and desired cosmetic results. She answered questions and educated me on options available for the procedure I was contemplating. In doing so, I was able to make a well-informed decision about my plastic surgery procedure. As with any medically invasive procedure, one experiences a heightened degree of anxiety. The staff and Dr. Harirchian went above and beyond to ease my anxiety throughout this process. I am extremely pleased with my results thus far and I attribute part of that to the care the staff provided and masterful surgical skills of Dr. Harirchian. I enjoyed my visit due to Yolanda’s friendliness and Dr H taking her time to explain the procedure. I felt Dr H understood what I was trying to achieve and made me feel at ease. I will definitely schedule my procedure soon. I cannot express how pleased I am with the results. I have eyes once again and I can see better. Dr Harirchian has been a pleasure on all levels. I would recommend her highly. Upper blepharoplasty, browlift. My rhinoplasty results were exactly what I hoped for. I had an amazing experience with minimal bruising and swelling. The doctor and staff were very welcoming, thorough and professional. I felt really good a day or two after the procedure. I feel much more confident with less make-up on now. After attending the Hotel Zaza event and meeting Dr Harirchian, my friend and I both decided to have our facelifts done by her. I know for myself after visiting several other plastic surgeons that she not only made me feel comfortable about the process but she has the ability to succeed in the way that I was wanting. I am very happy with results. Doctor is very professional Thank you very very much! For upper blepharoplasty, lower blepharoplasty. I wanted to look more alive, refreshed, youthful. I feel there was improvement, and I am also more educated on my body. Dr Harirchian is one of the most, if not the most, kind, gentle, informative doctors I have seen. Upper Blepharoplasty, lower blepharoplasty skin pinch, under eye laser, later followed by vampire facial. Dr H is very personable and made us feel comfortable. Provided her clinical assessment and recommendations and gave us time to make decision on whether to move forward with procedure. Experience was good, outcome was excellent.